Hermann was born to make wine. His mother's family had over 300 years of winemaking experience in the Mosel, and his father was responsible for restoring vines in that region after World War II. Hermann grew up learning to graft vines by hand with his father before attending prestigious German winemaking and viticultural institutions. When Hermann moved to New York he discovered that the western shore of Seneca Lake was quite similar to the cool climate and gravelly soils of the Mosel. Using his grafting skills, Wiemer planted one of the first successful vinifera vineyards on Seneca Lake in 1976. His dedication and attention to detail allowed the project to thrive, and Hermann J. Wiemer has become known as a premier domestic Riesling producer. 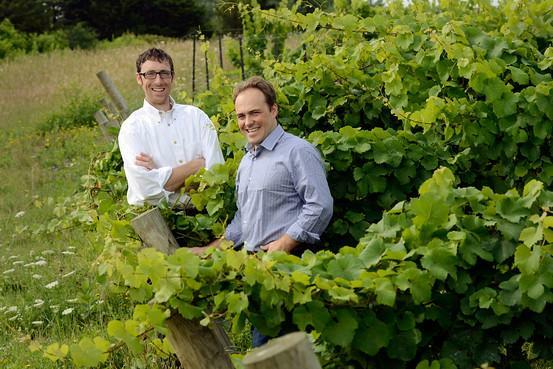 Since 2007, the winery has been run by Hermann's longtime apprentice Fred Merwarth and the agronomist Oskar Bynke. Fred works to further Hermann's vision by precise and thorough vineyard management and winemaking, while Oskar focuses on winery operations.
" Our versatile, Kabinett-style Riesling is marked by a refined interplay of sweetness and freshness. Harvested in the heart of our season, this delicate, fruit-forward wine reveals the classic flavors of the varietal. The Riesling grape is known for expressing well in any range, from dry to sweet. James Suckling 92 "An extraordinary "regular" quality dry riesling brimming with lemon, lime-pie, passion-fruit and pineapple aromas. The medium to full body is lifted by refreshing acidity, and the fruit flavors are usually succulent for a dry wine. The finish is at once powerful and silky.